Sometimes life doesn’t make sense. In a world and culture that loves rhythms and systems, order and reason, sometimes life runs against the current. Chaos abounds, and it’s enough to drive us all mad. So what do we do when the chaos hits the fan? What do we do when the world’s run amuck and we don’t know up from down?Here’s my laptop confession: I eat chocolate and TV binge-watch. We are not promised order, as we define it. We are not guaranteed to always understand. However, we are ensured that we don’t have to know the ins and outs of all that lay before us. That truth is a really hard pill to swallow…chocolate is much easier. How do I reconcile that in my heart? If we are to live under grace, and extend grace to others, and to live in Gospel-centered community, we must train ourselves to think outside common sense, order, and definitions. Forcing ourselves outside of common sense is quality practice. Jesus and His “upside-down” kingdom runs counter to all cultural common sense. The first shall be last. Debt is freely cancelled. Those are not lessons from Kindergarten. From early on, we are groomed to follow the line leader and to take responsibility for our actions. We are taught how to fill our sticker-chart of good deeds. Having a plan, asking questions about the plan, and having a back-up plan feels responsible, and there are times when this is required of us. So when we are occasionally asked (or forced) to not have a plan, we can feel lazy, dull, and even immoral. To practice frivolity, at least to some degree, stretches us outside our common sense limits and our desire to control the chaos. Grace often resides beyond these personal boundaries and the limits we’ve drawn. Perhaps we should push ourselves outside these cultural guidelines so often, that functioning against the cultural current begins to feel normal–less uncomfortable. Today the kids have their Valentine’s parties, and so we’ve been getting our “creative” on. We decided to order cards from the store, so the other night we had a photo shoot. In an effort to practice frivolity, we threw out common sense. It seemed more like Halloween than Valentine’s, and I believe we successfully thought outside of the box. (Pinterest makes it really hard to be truly unique.) We stepped beyond order and reason, and with a little bit of crazy and a whole lot of laughter, we came up with a plan–a plan of non-sense. 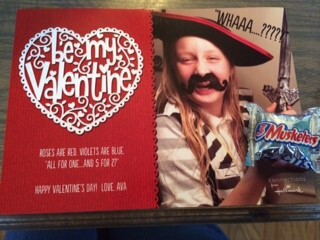 Ava’s favorite candy is Three Musketeers. I’m sure there is someone smarter than me who could have drawn a connection between the sword-toting trio and Valentine’s Day love, but I had nothing. 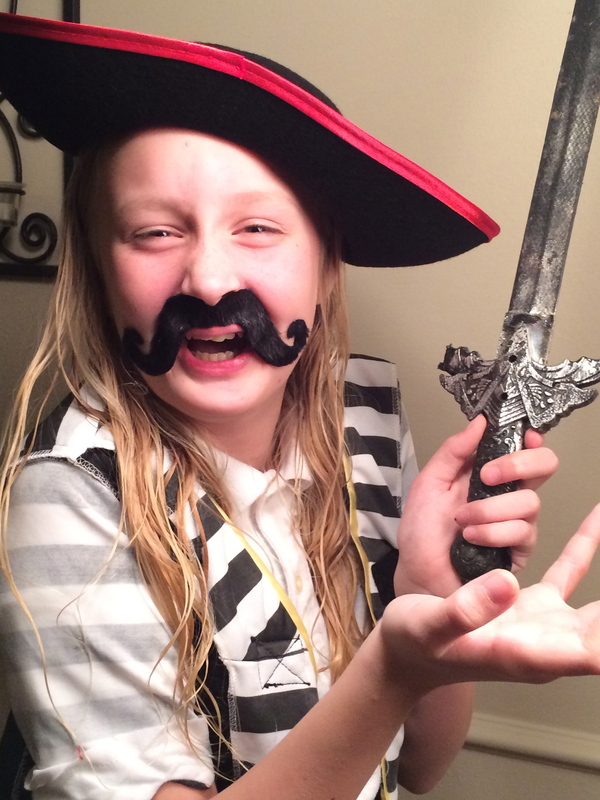 We bought the candy, a fake mustache, and inverted Gideon’s pirate costume. 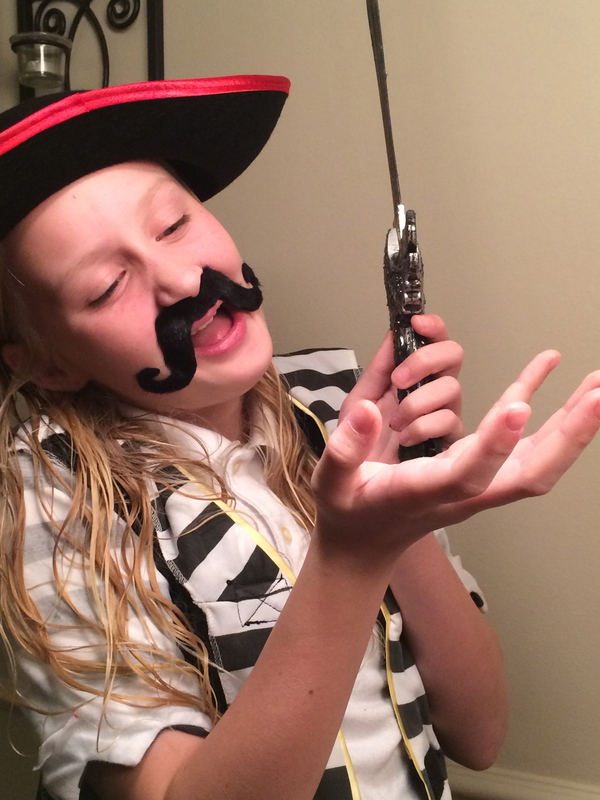 Ava, who has an amazing ability to defy inhibitions, slapped on the facial hair and hat, and began hamming it up for the camera. 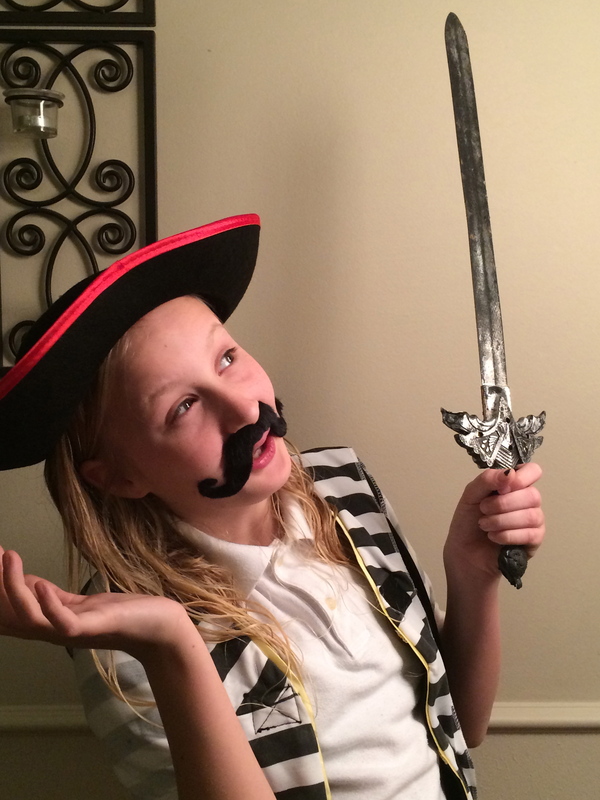 This musketeer embraced the utter non-sense of it all…and we laughed. The lack of meaning and connection became the thrust of our message. You see, when we cling to reason and order, to practicality and systems, we miss musing in the senseless things of life, or at least the things that seem senseless to us. I mentally draft connections from one event to another, or apply meaning to a situation that just simply doesn’t exist. It’s my meager attempt to make sense of life, to organize the chaos. Meanwhile, I miss the freedom in the chaos, notably that I don’t have to figure it out. When I don’t know what to do with my kids and their behavior, I find myself holding fast to proper procedures and guidelines. In turn, I miss the beauty of extending true grace…that which is undeserved. My rules are all about what is earned and deserved. Grace doesn’t fit in that box. ….and since the first instruction in the Garden, it hasn’t been humanity’s place to know. I desire what isn’t for me (namely, knowing the plan and controlling the situation). Not much has changed since the Garden. Eve and I have much in common. One would think I could learn from her story. For when her eyes were opened, it didn’t go well. I desperately want to see the big picture, the plan that lies ahead…at least how the next few weeks will pan out. I want to make sure my children respect authority and obey the rules, often at the expense of grace. But it isn’t for me to know and it isn’t for me to withhold that which is so freely given to me. And if all that I seek to see was indeed revealed to me, I can only assume that the irresistible knowledge I crave now wouldn’t satisfy in the end. I can only assume that without grace, my children would grow up to be wonderful, respectful citizens, but who sit in constant judgment and have ongoing relationship inadequacies, including relationship with their heavenly Father. SO…I practice. While cute on a Valentine’s card, I currently struggle to experience non-sensical joy in the midst of chaos and unknowing. I’d like to say I could, because after all, that’s what a Proverbs 31 woman would do: “laugh at the days to come.” But let’s get real…when the chaos hits the fan, trusting God’s plan worry-free is a set of skills most of us lack. So I practice the skill, even in silly photo shoots, which honestly, takes no risk. But even that little taste of embracing the self-adhesive mustache makes the crazy around me slightly more palatable. Can you imagine if I practiced this skill with grace? That takes guts! I can only imagine that the effects on myself and those around me would be astounding. When we are not trusting, when we do not know or acknowledge Him, He is still faithful. He still equips us–with peace and with grace. When we are in the wilderness, He continues to guide, though we whine and complain with every step. He continues to know us and our cravings to understand and make sense of the desert. He calls us by name…even when we resist to call on His. He promises to make at least one thing known to us…Him. He will supply us with frivolous grace, and even more opportunities to shower others with the same. He will sustain us in the chaos, when we don’t see a way. It is because of His faithfulness that I am compelled to respond with trust. I trust not because I can make sense of the situation, or predict the future. I can trust that when grace is given, Jesus takes care of the consequences and conviction that my guidelines and sense of justice want to establish. I will not walk forward in hope because I have a glimpse of what He is doing. I know it depends on nothing of me, no will or exertion, not even an optimistic outlook, and therefore, I am free to not have one. I press on with wishy-washy hope and just try to trust. I will start with baby steps and simply try to trust Him with the plan, and with the aftermath of His grace. (Accompanied of course by chocolate and tv drama).